For the past five years, it’s been a ritual with a few members of my ski posse that we hit up Snowbird and Alta for a little variety. After all, this place has everything we skiers and boarders crave — and it’s an easy, fairly inexpensive flight to Salt Lake City. If you plan it right, you can actually catch a morning flight from Spokane International Airport and be shredding the hill within three hours after takeoff. Both resorts are just a short 30-mile drive south of Salt Lake City, nestled at the upper end of the Little Cottonwood Canyon. The legendary Little Cottonwood sits in the heart of the Wasatch Mountains, which are world renowned for accumulating that Dry Utah Powder. The average snowfall in that canyon exceeds 500 inches. That’s a lot of snow! Let’s start with Snowbird, or as the locals call it, “the Bird.” With more than 2,500 skiable acres, a vertical drop of 3,240 feet, 500 inches of annual snow, one tram, four quads and six doubles, you can see this place can be a lot of fun. It’s one of my favorite skiing playgrounds. Besides the abundant dry snow, one of the many other things that draw riders from all over the world is the even keel of terrain, with 27 percent for beginners, 38 percent intermediate and 35 percent for the advanced. As far as the riding goes, it’s first rate and there’s nothing better than long, high-speed cruiser laps on the Chips Run, which goes from the top of the upper tram to the lower tram deck at the base of the mountain. Chips winds its way down the middle of the Peruvian Bowl, and if the 2.5-mile groomed run doesn’t get the legs pumped up, then just pop over into Gad Valley for plenty more groomers. If you’re like me and like venturing off for a little steep and deep — which by the way there’s plenty of at the Bird — then slip into one of my favorite haunts, Mineral Bowl, and ride the rocky crags known as the Bookends. Or you can push the envelope and challenge your skills on the same venue that the North Face Masters snowboarding event takes place, off the front side of North Baldy. There’s plenty of nail-biting terrain that will make the most advanced riders get a little pucker! With four slopeside lodging options to choose from — amounting to a total of 882 rooms — and 15 different restaurant choices, it’s pretty easy to see why Snowbird is well recognized by the international ski community as a destination. On my last trip to the Bird with Scott Evans, the originator of the Shotz Ski, and Joe Johnson, a former Spokanite and now a Utah local, we met up by chance with a group of Polish skiers in one of the many outdoor heated swimming pools. This group traveled all the way from Poland to ski Snowbird. This chance meeting ended up being a cultural experience, as the Poles introduced us to their homemade vodka and many drinking songs. (I think that’s what they were.) Not to be rude, we had to reciprocate and introduce them to the World Famous Shotz Ski! Just doing our part as goodwill ambassadors. 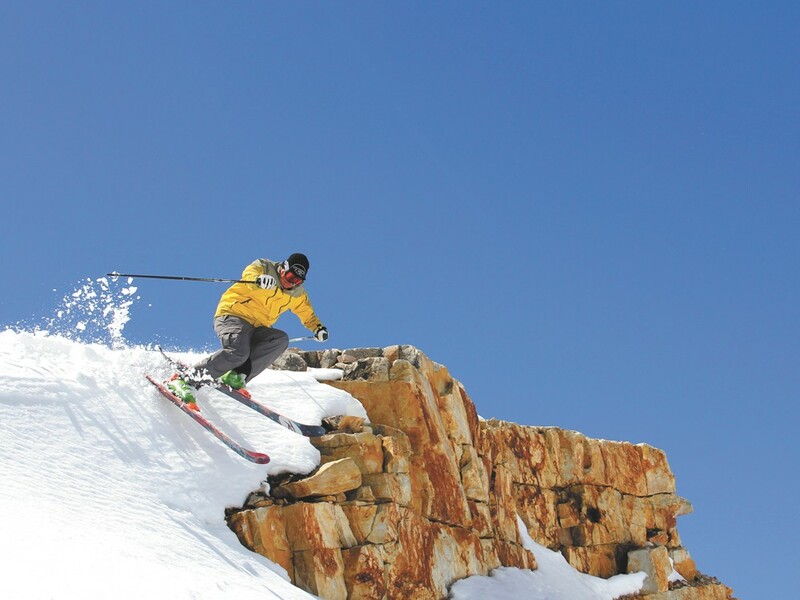 Just a short drive, one mile up the Little Cottonwood, is the skier’s ski resort of Alta. Alta is the polar opposite opposite of the Bird and has a laid back vibe but still plenty of character. This mountain is loaded with fun terrain, from beginner to expert, and it’s known for collecting a little more snowfall than its neighbor, with 560 inches annually. It’s easy to see why die-hard powder skiers and purists are always hanging at Alta. You might have noticed that I only mentioned skiers, as Alta is one of the few resorts in the United States that prohibits snowboarding on its slopes. Poor decision on their part, but that’s just my opinion. With more than 116 named runs, seven chairlifts, three surface tows and a moving conveyor for the beginners, there’s plenty of terrain to be had. Whether you’re ripping groomers on Mambo or getting into a little sidecountry in Baldy Chutes or Devil’s Castle, Alta has something for most every skier. Alta’s not about the glitz and glamour, it’s about the skiing, pure and simple. As far as lodging, look into Snowbird lodging for more choices — and that’s where most of the nightlife is. Make sure you give yourself at least three days to ski these places, with four days being ideal. Between Snowbird and Alta, you’re in for a treat. If you’re feeling like a really big day, you can ski 4,700 acres with an Alta/Snowbird interconnect lift ticket. Located in the saddle between Snowbird’s Mineral Basin and Alta’s Albion Bowl, you’ll find a connection gate that allows access to both Alta and Snowbird in one day. If you’re looking for a little change-up, give Snowbird/Alta a try. But if by chance you run into a small group of Polish skiers singing drinking songs out in the pool, keep walking. Just sayin’!